Candi Staton says in the video: You will be my guest at The London Jazz Cafe and I want to bring you on stage and honour you for playing 'Young hearts run free'. Now, music icon Candi Staton has come back with a special message for the fan in a recent clip uploaded to YouTube. She would like to find Stephen and invite him on stage for her upcoming performance at the legendary Jazz Café in Camden, London! Candi has not been able to reach him personally, she asks everyone to share this video so that she can find him for this amazing opportunity. If you know Stephen or think you know someone who does… spread the message and use the hashtag #CandiFan. 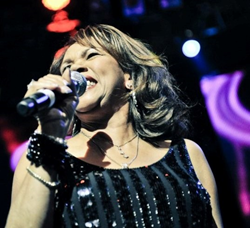 Watch the video here: http://www.quitegreatmusicpruk.com/music-videos/2014/7/18/candi-staton-sends-special-message-to-fan.html. Candi will be looking to finally release her 27th album 'Life Happens' in the UK this October, with recent performances on Letterman and an upcoming tour to follow, which includes a performance on the main stage at Bestival.